Les Chanteurs is the "Easy Audition" beginning ensemble for women. 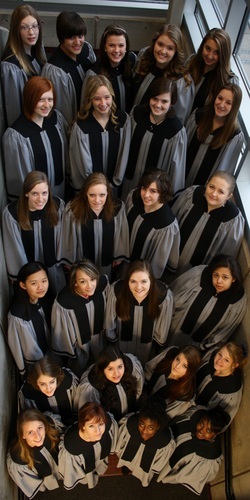 Most are sophomores; many will go on as juniors and seniors to participate in Concert Choir and Trilogy. Audition requirements include pitch matching, scales (for vocal placement) and simple five-note melody matching exercises. Students sign up for the choirs course during registration (no signature is required) sometime during January or February. During late March, registration sheets are confirmed and in April students are invited to complete their audition. Students may transfer in at any time provided that they complete an audition before entering. Concert attire for students in Les Chanteurs is a grey robe with dark, muted colors underneath and black hose and black close-toed shoes. Hair should be pulled back and lifted (in a bun or something similar). Other performance opportunities may be available and will be announced in class. Students in Les Chanteurs may participate in WCSD Select Choir, UMEA Honor Choir and/or Solo and Ensemble (see the Event Descriptions page) . In 2014, Les Chanteurs students are invited to participate in Choir Tour -- a trip to southern California to perform and watch performances. There is a $25 robe cleaning and replacement fee associated with participation in this choir.